Home Instagram Jadine Nadine Lustre News On the Wings of Love Nadine Lustre Speaks Out About the Issue of Being Depressed. 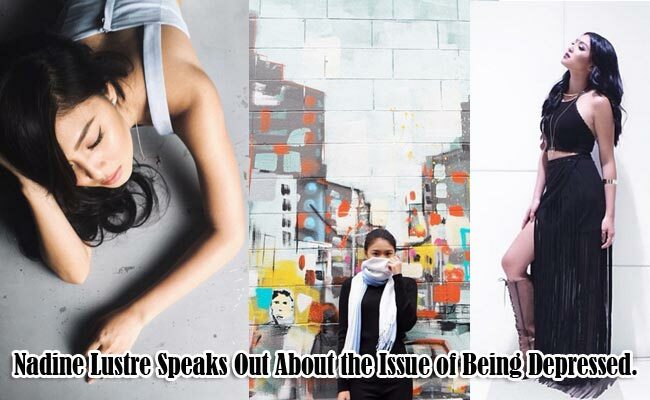 Nadine Lustre Speaks Out About the Issue of Being Depressed. One of Kapamilya’s in demand actresses – Nadine Lustre admitted that she‘s being depressed because of her personal issues in life. In her instagram account, Lustre posted pictures (which she eventually deleted) with a caption “It's gotten to the point where I don't know who I am anymore. I constantly feel like I'm on the verge of breaking down. I feel like my mind is going crazy, and if my mind is an ocean, my thoughts are a tsunami. I can't sleep, I can't concentrate, I can't even think straight. I am a mess. I'm coming apart at the seams and it scares me," and these are insinuation that the said actress was suffering from depression and made her fans worried about her. Nadine Lustre threw her appreciation to her fans by posting a picture in her account saying “Thank you for sticking with me through whatever”. And it was flooded by bunch of comments urging her to stay strong and have faith in God. In her interview with ABS-CBN News’ reporter Gretchen Fullido, Nadine Lustre confirmed that she felt depressed because of personal issues. "I was feeling depressed. Basta personal. It's not with my career," Lustre said without giving any words about what she was going through. With the said interview, Lustre said that, this helped her to portray her character as Leah on her hit show On The Wings Of Love. "Hindi ko alam kung dahil ba kay Leah kaya ako nagkaganoon o dahil ba talaga sa issues ko in my personal life kaya na-pull off 'yung pagiging ganoon niya," Lustre said. She also admitted that she finds it difficult to deflect in her character on OTWOL. But despite of what she was going through, Nadine Lustre considered it as a blessing to her career. She said that, two years ago, she had wished to have a successful career and she couldn’t imagine that it was really happening to her right now. The actress was really thankful about on her stature in showbiz. Recently, Nadine Lustre celebrated her 22nd birthday out of the country. She and her close friends, Yassi Pressman and stylist Jhelo Cristobal, went to South Korea. Lustre, posted some of their pictures in Korea featuring the Seoul’s main shopping and tourist district Myeong Dong and used the hashtag #Seoulsearching.